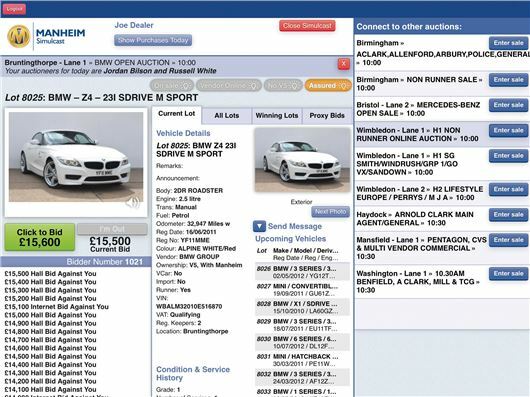 Simulcast, developed in the UK over 10 years, allows car auction buyers to browse vehicles and bid and buy online at different auctions concurrently. After a 300% increase in online bidding, the latest imrovements have been rolled out throughout Europe. Improved features of Simulcast include a mobile-friendly function, instant online stock previews, improved vehicle grading and online payments, bringing the European system in-line with Simulcast in the UK and giving online bidders an even faster and easier way to find the vehicles they want. These improvements have seen the popularity of Simulcast grow across Europe. Figures from Portugal alone show online sales up by 20% in Lisbon and 18% in Porto. The average number of log-ins is up by 30% too, and those bidding via Simulcast have grown by 45%. Michael Buxton, Manheim's CEO, said: "Manheim works hard to understand its customers' needs and uses innovative technologies to offer the most flexible and convenient ways to do business. Our latest version of Simulcast in Europe is an example of this, and supports the growing popularity of online bidding and buying." "Figures from both online and in-lane auctions show that Simulcast supplements our popular physical auction programme. This is something we expect to see continue in the future, with products such as Simulcast helping to bring a far wider range of customers to Manheim for their vehicle solutions." Manheim UK is now part of Cox Automotive, the world's largest provider of automotive services to fleets, motor dealers, vehicle manufacturers and traders across cars, motorcycles, plant and commercial vehicles. Cox Automotive is a division of the family-owned Cox Enterprises Inc. global group of communications, media and automotive services providers.